Author JK Rowling has apologised for incorrectly accusing Donald Trump of ignoring a disabled boy. A video emerged that appeared to show the US president refusing to shake the boy’s hand at the White House. “How stunning, and how horrible, that Trump cannot bring himself to shake the hand of a small boy who only wanted to touch the president,” the author said. 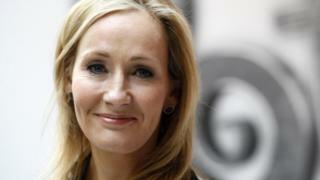 But Marjorie Kelly Weer, mother of Monty, said Rowling’s interpretation of the clip was wrong. The Harry Potter author tweeted: “Re: my tweets about the small boy in a wheelchair whose proffered hand the president appeared to ignore in press footage. “Multiple sources have informed me that that was not a full or accurate representation of their interaction. Rowling didn’t apologise to Mr Trump himself. Mr Trump is said to have shaken the boy’s hand as the president entered the room. Rowling has deleted her initial tweets on the subject.